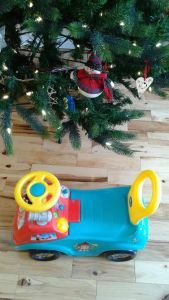 Writing by Kate Estabrooks: Ghost in the...Toy Car? It plays music, the horn honks, and there are other, literal, bells and whistles. The sounds freaked Kiddo out at first, but now he thinks they're great. I've gotten used to random honking and chirping coming from the living room. 1) Temporal anomalies. Push the button today, hear the sound tomorrow. 2) Ghost in the toy car. Ghost of Christmas Past, perhaps? 3) This primitive machine has acquired sentience and is expressing its displeasure at being held captive. 4) Interdimensional beings attempting to communicate. 5) This secondhand toy has a sticking spring or other mechanism, and I've been watching too much Supernatural. Not likely, I know, but I thought I'd throw it in the mix. If you look closely at the photo, you may also notice our tree decorations include another toy car and a CD case (to the left of the snowman). Kiddo and I have differing tastes when it comes to Christmas decorations. Speaking of Kiddo, he's awake and it's time for us to watch The Muppet Christmas Carol, my favorite Christmas movie of all time—except for Die Hard. Nothing says Christmas like Bruce Willis jumping from the top of Nakatomi Plaza with a firehose tied around his waist.